It’s that time of the week again, and Kirk had everything set aside for me, and ready to go, including the new Star Wars (!!!) title, Shattered Empire. So, as always, I was quite happy to pop into what has fast become my favorite comic stop, West End Comics. So let’s dig in and see what’s on the list this week besides STAR WARS!!! Head Lopper (Image Comics) issue 1 (of 4) written and drawn by Andrew Maclean with colors by Mike Spicer and Maclean. 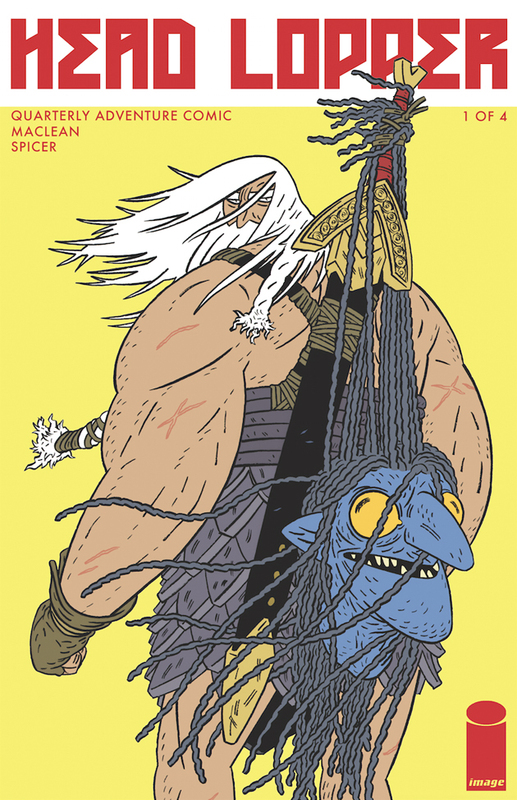 What feels like a melding of Mike Mignola art and a medieval legend retold and remade, this quarterly book follows Head Lopper, Norgal, if you prefer, and the talkative head of Agatha Blue Witch. Arriving on the island of Barra, the warrior quickly proves himself against the vast array of beasts that keep the inhabitants in fear, but intrigue in the palace may be organizing a larger plan and Norgal may be the key to unleashing a more powerful evil. Moments of humour, lots of head lopping and a fun art style make this one a fun read. And on the plus side, it’s a big book, on the down side, it’s a three-month wait for the next installment. Still, this one comes across as unique, and so far, I’m liking it. Star Trek/Green Lantern: The Spectrum War (IDW/DC Comics) issue 3, written by Mike Johnson, art by Angel Hernandez, colors by Alejandro Sanchez, and letters by Neil Uyetake. 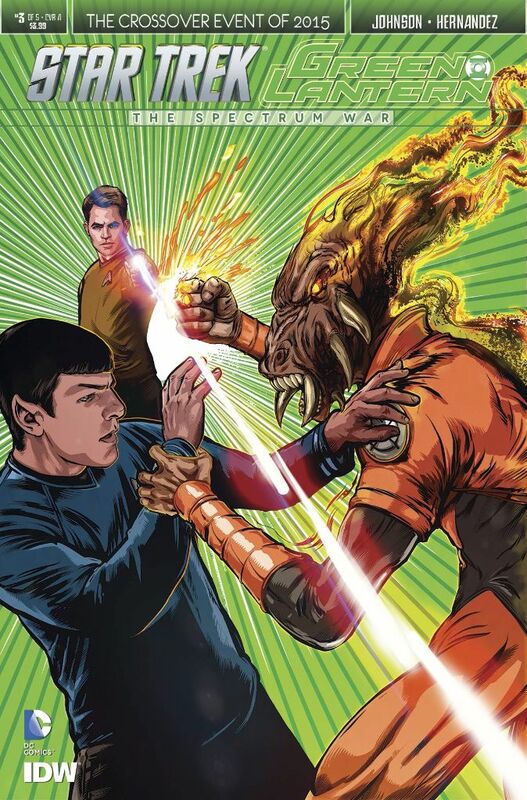 As Jordan and Kirk try to figure out what is going on, the newly minted ring-bearers are trying their new powers, and the Gorn, and Chang, are going to be a serious problem, especially when their counterparts from the Lantern Corps show up and start teaching them and guiding their powers. It looks like the Federation may now be on the brink of war with both Empires, but things are about to get worse. The being, Nekron, who caused the Oa Guardian to implement the Last Light, by which the surviving Lanterns were pulled into the Trek-verse, has found his way into that universe as well, and is about to raise an all new army of the dead to wipe out this universe as well. 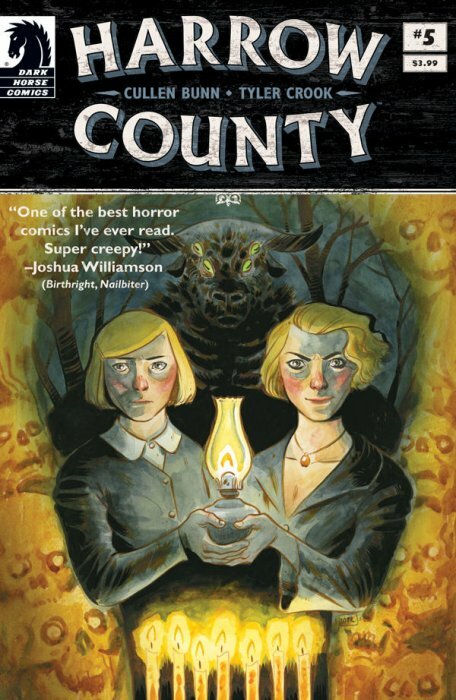 Harrow County (Dark Horse Comics) issue 5 script by Cullen Bunn, with arts and letters by Tyler Crook. This book continues to be one of my favorites, and while undeniably creepy, from issue to issue, this one seems a little lighter, as if we’re taking a breath before plunging into the depths of darkness again. Emmy is settling into her new role in the town, people come to her for help, and aid, and she, is able to speak with the haints that continue to haunt the area, find out what they are, what they want, and help them to peacefully co-exist. (Priscilla is a nice touch). Not all of the haints, or the locals are happy with her though, but an uneasy truce seems to have been brokered for now, and the witch Hester, seems to be pushed down far inside Emmy, where she has no power. That doesn’t mean things aren’t going to go bad soon, we caught a glimpse of someone who looks just like Emmy last issue, and they wait until the last page to bring her in, and reveal who she is. Which wasn’t much of a surprise. Still, we get to see Emmy almost at peace with herself and her environs, though she wants a normal life (something she realizes while talking to the Boy’s Skin). This book continues to be beautifully drawn, and incredibly well written, and while this one really wasn’t, it’s generally pretty creepy… which tells me there’s a storm coming! Star Wars; Darth Vader (Marvel) issue 9, written by Kieron Gillen, art by Salvador Larroca, colors by Edgar Delgado, and letters by Joe Caramagna. Inspector Thanoth is digging into the heist that Vader orchestrated, so the best place for Darth to be? Right at his side, hunting down clues, and trying to keep his secrets safe. But the two twins, Morit and Aionin are on the same planet, causing problems as well. 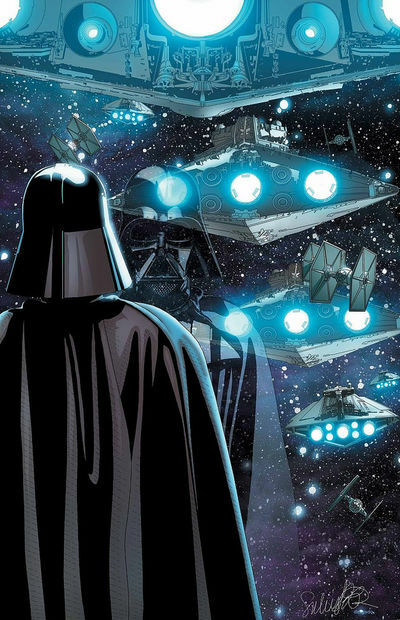 There seems to be lots going on in the Empire right now, and Darth seems to be at the center of a lot of it. Doctor Aphra, Beetee and Triple Zero meanwhile, are doing some digging of their own and their path is going to lead them to Naboo! The art, the story, I’m loving it all. I’m a little anxious about the twins, sure they don’t really have the Force, they only have enhancements to make it appear as if they have some Force abilities, but I don’t know… something about their plotline rubs me the wrong way, so I’m hoping there’s a pay off on that story soon, or perhaps they can just fade into the background again. I’m much more interested in what Vader and Aphra are up to…. Still, none of the Marvel Star Wars titles have done me wrong yet, so let’s take the plunge into the final comic this week, and find out what happened immediately after Return of the Jedi. 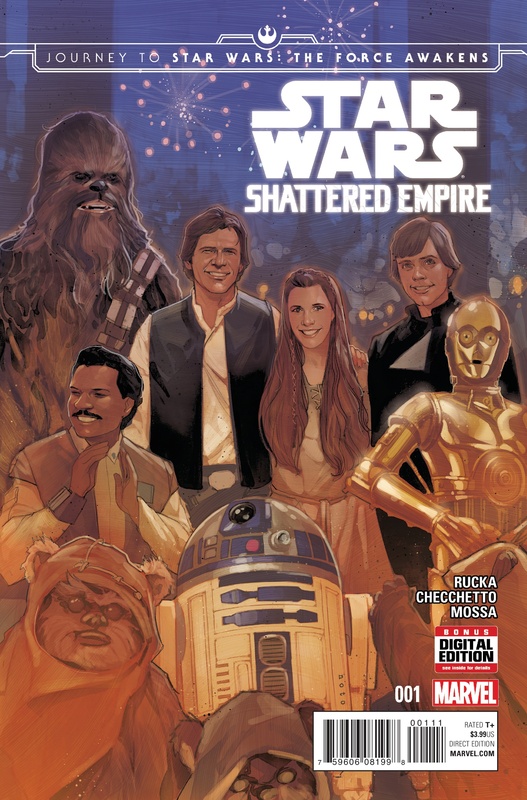 Star Wars: Shattered Empire (Marvel) issue 1, written by Greg Rucka, art by Marco Checchetto, colors by Andres Mossa, and letters by Joe Caramagna. The Journey to Star Wars: The Force Awakens continues! The first issue finds us in the last moments of the Battle of Endor, and while we get glimpses of Lando, Chewie, Threepio and Han, and hear Luke, the majority of the tale follows Green Four, a pilot named Shara, and her hunt for her husband, one of General Solo’s strike team, Kes. They enjoy an evening of celebration, along with the rest of the alliance, before Han and Chewie pull a team together to attack and destroy an Imperial base, where troops are holding up on the other side of the forest moon.